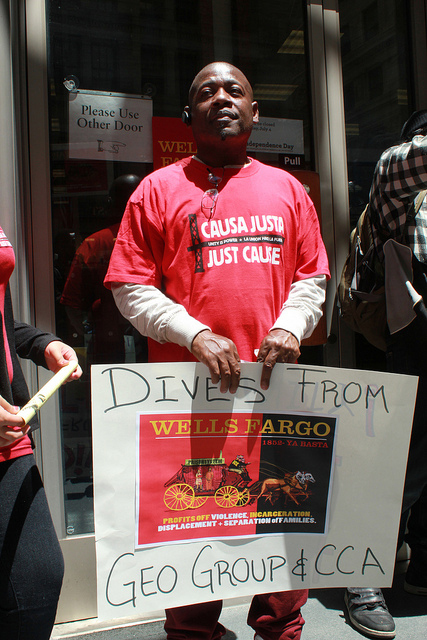 Wells Fargo: Divest from prisons! Community and labor groups here in the Bay Area and 13 major cities across the nation took to the streets on July 1 – the day new anti-immigrant law was set to be implemented in Georgia. This legislation accelerates the detention of immigrants. Protesters demand that major shareholders divest their holdings in the Corrections Corporation of America (CCA) and the GEO Group (Geo). These are private prison companies run immigrant detention centers and prisons for the U.S. government. Private Prisons and investors are set to reach record profits from HB87. There’s a short video about it at the end of the page. 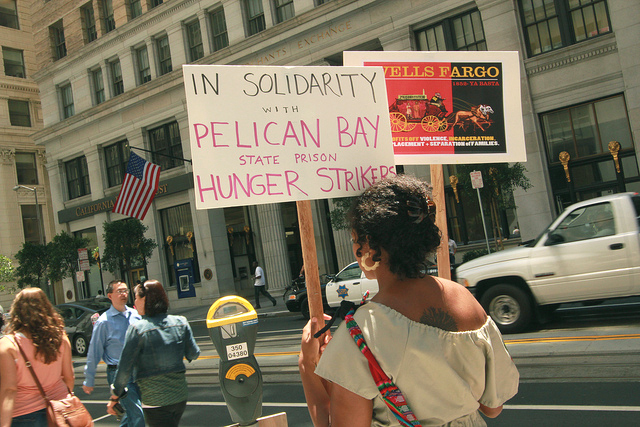 Friday’s action was also to stand in solidarity with a prisoner hunger strike beginning July 1 at Pelican Bay State Prison to protest the inhumane conditions of their imprisonment. Wells Fargo has 4 million shares in Geo Group and 50,000 shares in CCA, most current Security and Exchange Commission filings state. Their combined prison holdings are valued upwards of $120 million. Geo Group is a client of Wells Fargo. Wells Fargo and Geo share the same lobbyists in Washington D.C. firm, The Podesta Group. Through the pressure of actions held on May 12, Pershing Square Capital Management has already divested over 7 million shares all of its holdings from CCA, paving the way for other investors to follow. — Cinthya Muñoz Ramos, Immigrant Rights organizer for CJJC. Major investors in the private prison industry include Wellington Management Company, Vanguard, Wells Fargo Bank, General Electric, Fidelity and others. Community groups and unions across the US, are calling on all public and private institutions to divest their holdings in Corrections Corporation of America (CCA) and GEO Group, America’s largest private prison corporations which have profited from $ billions in taxpayer money. 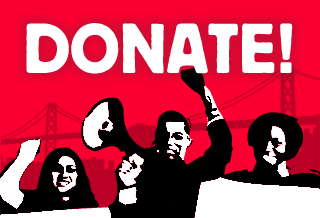 • We are calling on Wells Fargo to stop investing in the GEO Group and other corporations that are profiting off of immigrant detention centers and private prisons that detain immigrants and separate families. 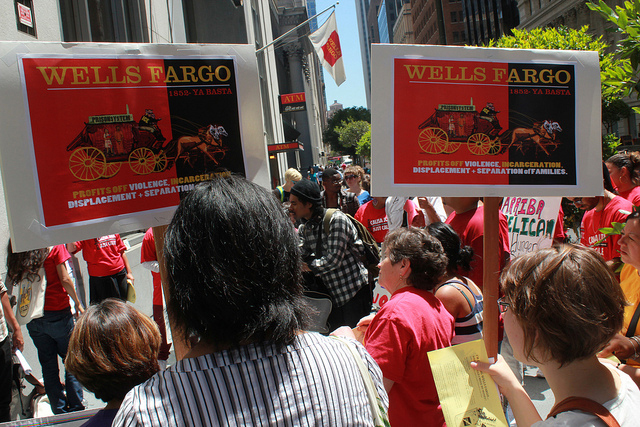 • We are calling on Wells Fargo to cease all illegal evictions of tenants in foreclosed properties and commit to working with real estate companies and servicers who follow local and state tenant protection laws. One in five foreclosures in the nation are concentrated in California and Wells Fargo owns a significant portion of loans that they have allowed to go into foreclosure. Wells Fargo exploits loopholes in property tax laws and federal tax shelters and in doing so, avoid paying their fair share of local, state and federal taxes.